The photos on this website represent only a few drops in the ocean of possibilities. Contact us with your ideas and Andy will create a head-turning custom piece that will last for generations to come. 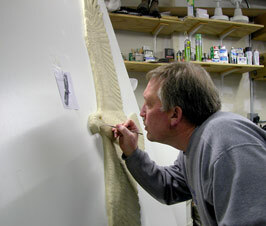 Nationally-known artist Andy Schumann has been creating custom sculptures and corporate gifts and incentives for over 20 years. He’s known for his extraordinary designs, attention to detail, and open collaboration with his customers. He has created items as small as personalized golf ball markers, to an exclusive 20-ft. tall Native American Spear fisherman for a Casino in Marysville, WA. (left) He works with clients in the local Milwaukee, WI area, as well as across the U.S. Schumann works in a variety of materials including Pewter, Steel and Bronze. Consider having Andy create a personalized and exclusive design for your company or personal collection. He will work with you throughout the process. Your project will begin with a sketch of design ideas. Once approved, a soft model of the final piece will be completed, and then the final production will take place. During the project you will have the opportunity to communicate with Andy for suggestions and changes. 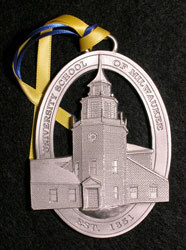 Pewter zoo ornaments have become a signature project for Schumann Sculpture. These ornaments are part of the Milwaukee Zoological Society’s fundraising efforts, and have now become a collectible gift line. Andy can depict your company logo or product in unique corporate gifts. “I always encourage your input and ideas, especially in the early stages. Making changes along the way before final production is much easier and makes for a satisfied outcome”. Let your imagination go. Andy would like to see what you have in mind. Contact him directly at (414) 510-7963.